Imagine a spa-like experience in the privacy and comfort of your own bathroom, while promoting better health and hygiene! The newly designed Elite3 is a convenient, easy to install, attachable bidet that surpasses all industry standards and expectations. Designed with comfort in mind, this ambient temperature, non-electric bidet provides an invigorating posterior wash and a softer mist for the feminine wash. The new P.S.P.C. (Positive Stepping Pressure Control) allows you to easily change pressure to create an experience that blends comfort and ease of use, all the while helping to keep your bathroom tidy with a highly effective splash guard. To support better hygiene, the Elite3 is the first natural water bidet with a dual nozzle and a self-clean feature to make maintenance quick and easy. The Elite3 model is unique because unlike other brands, it combines quality, and safety into a high quality product that is designed to last with minimal maintenance. The Elite3 is assembled with a durable built-in UPC (Universal Plumbing Code) certified check valve made in the USA to help prevent any backflow. Elite3 also comes supplied with a high-quality and durable braised metal hose and a solid brass 3/8” T-valve, which makes installation safe, quick, and simple. Simple and Easy operation and installation. Available in White ONLY. Fresh & Affordable. Instant Spa Experience. The Elite3 is an ambient temperature, non-electric bidet that runs off of your home’s current water connection. Built with a dual-sided ABS housing that protects the water lines within, this bathroom addition is designed to accommodate standard 2-piece toilets and most 1-piece toilets without a French curve. The newly designed Elite3 is a convenient, easy to install, attachable bidet that surpasses all industry standards and expectations. Designed with comfort in mind, this ambient temperature, non-electric bidet provides an invigorating posterior wash and a softer mist for the feminine wash. Durable brass inlet and installation parts. The Elite 3 started off like most in its class: Plastic valves, plastic connections, plastic stems. Questionable. Flimsy. In the 2 years since its initial release, the Elite 3 has undergone many changes. The plastic valves, inlet, and stems were upgraded to silver brass thus exponentially increasing the dependability and longevity of the bidet. The plastic tubing was upgraded to a braided metal hose and the T-valve connection was upgraded to a solid metal universal 7/8” T-valve. Today’s Elite 3 is all brawn. No electricity or battery is needed. How does a bidet work without electricity? The answer is simple. By connecting the bidet directly to your fresh water line makes it possible to run on only water pressure. Non-electric bidets are affordable, easy to install, saves you money on toilet paper, and do not cost you a cent in electricity. 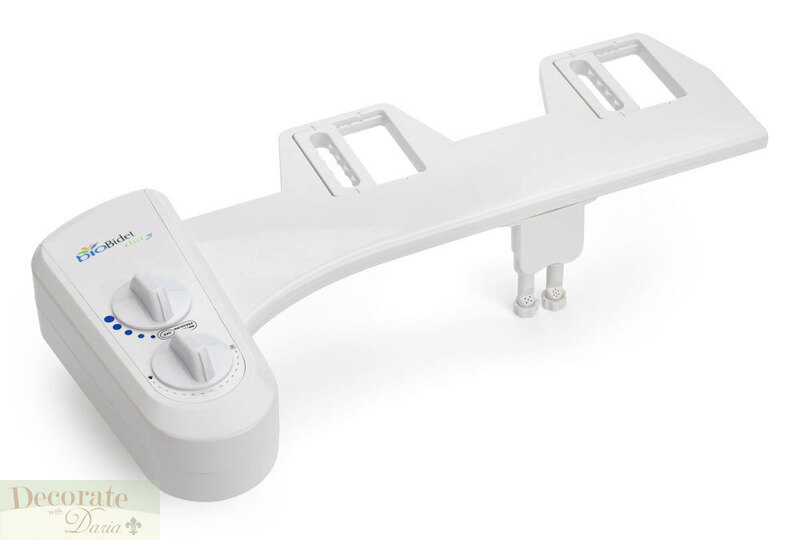 This is why non-electric bidets are considered to be the most economical type of bidet. Dual Wash for a Thorough Clean. The Elite 3 establishes itself as the perfect family bidet due to its spray range made possible by the dual nozzles. Having dual nozzles means that there is a separate nozzle for the Posterior wash and a second nozzle for the Feminine wash (or Anterior wash). Both nozzles are conveniently retracted behind a splash guard to protect them from debris when not in use. The nozzles will extract and spray only when selected to ensure ultimate hygiene. At Bio Bidet, we have high expectations when it comes to obtaining quality and durability without sacrificing performance. By constructing the ball valve and stem with solid silver brass, the end result is outstanding. Designed to withstand pressure and frequent use, the quality silver brass flow valve design is one of the most reliable types of valve designs to be used in a non-electric bidet. Enjoy peace of mind while being able to reach excellence in hygiene for you and your family every day. One piece toilet has the toilet housed in one complete unit where two piece toilets has a separate bowl and tank. Offered Bio Bidet seat models are designed to fit all 2 piece toilets and most of 1 piece toilets. Only exception will be rare types of one piece toilets with severe French curves where toilet tank connects to the base of toilet such as type C below. Elite3 comes with 100% warranty coverage for full year from date of purchase.